Hello! 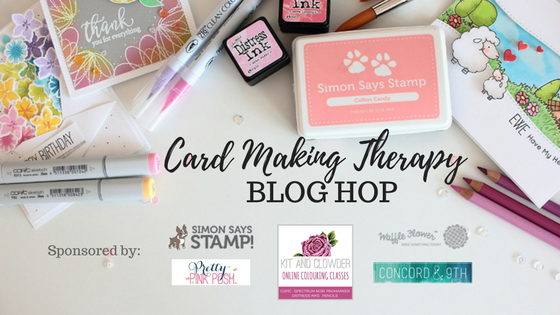 Welcome to the Card Making Therapy Blog Hop! I'm really excited to have you here and to be able to tell you about the powerful therapy that Card Making (and crafting in general) can be. You can read the story about how card making helped me overcome bulimia on this post. I'm also sharing which are the BASIC SUPPLIES you need to start making cards and much more in the video below (you can also watch at my Youtube channel). And don't forget to read all the way to the end! There are PRIZES and an amazing list of Card Makers. ¡Hola! Bienvenidos al blog hop Terapia de Tarjetería. Estoy muy contenta de tenerte por aquí y poder contarte cómo la tarjetería (y las manualidades en general) puede ser una muy buena terapia para las enfermedades mentales. Podéis leer la historia sobre cómo la tarjetería me ayudó a superar mi bulimia nerviosa aquí. Además he hecho un vídeo en el que os enseño los materiales básicos que necesitáis para empezar a hacer tarjetas desde cero y ¡muchas más cosas! Podéis verlo aquí abajo o en mi canal de Youtube. ¡Y no os olvidéis de leer hasta el final! Tenemos PREMIOS y una lista de tarjeteras increíble. In the video I showed you how to make this card using a basic list of supplies that you will also find at the end of this post. En el vídeo os enseño cómo hacer esta tarjeta usando un unos cuantos materiales básicos que encontraréis al final del post. - Six 20$ gift cards to the Simon Says Stamp store (one on each stop on the blog). - A 25$ gift card to the Concord and 9th store. - A 30$ gift card to the Pretty Pink Posh store. - A 25$ gift card to Waffle Flower Crafts store. - Two $20 vouchers to the Kit and Clowder online coloring classes store. The only thing you need to do for a chance to win is leave a comment! The winners will be chosen at random from the comments left on ALL THE POSTS of this blog hop by 11:59pm EST on October 17th and will be announced on my blog on October 19th. - Seis tarjetas regalo de 20$ cada una para la tienda Simon Says Stamp (una por cada parada del hop). - Una tarjeta regalo de 25$ para la tienda de Concord and 9th. - Una tarjeta regalo de 30$ para la tienda de Pretty Pink Posh. - Una tarjeta regalo de 25$ para la tienda de Waffle Flower. - Dos tarjetas de 20$ cada una para la página de clases para colorear de Kit and Clowder. Lo único que tenéis que hacer es dejar un comentario. Los ganadores se elegiran de forma aleatoria entre los comentarios de TODAS LAS PARADAS del blog hasta las 23:59 EST (ojo, no la hora Europea) del 17 de octubre y los anunciaré en mi blog el día 19. And now it's time to hop along! The first stop of the hop is LAURA BASSEN!!! Y ahora ¡a saltar! La primera parada es el blog de ¡¡¡LAURA BASSEN!!! Litte Crafty Pill > you are here! You know, craft has helped me to accept my father lost. A good therapy. Thanks for this opportunity and congratulations for your life and for your wonderful works. I love your crafting. Such a clean and simply beautiful card. Crafting helps me take my mind off of the things that bog me down. I feel free when I craft. Yay, what a fun hop! I love your card, really gorgeous design - like all of your work :-) You got a nice line-up of designers for the hop, too! Thanks so much for a chance to win! Thanks for the great video. It is very useful. And thanks for sharing your story. Love the card you made. Very beautiful. Beautiful card, clean and cheerful at the same time. Thanks for sharing your story and I agree, card making is the best medicine/therapy for me after a stressful day! Lovely card! Card making is definitely cheaper than therapy! Beautiful; I absolutely love the colors. Thanks for sharing. Gorgeous, beautiful card Amanda! Thanks for the fun hop and inspiration! Gorgeous card!!! Love your awesome colouring!!! I really like the card and that you have the courage to tell us your story!!! So I hope you will go on with all your great videos and cards! Very pretty card and what a nice video! Hi! I have PTSD and the fun that goes with it (bi polar, anxiety, etc.) I also use card making as therapy (as well as shopping for new tools, that's retail therapy!). I love your card! I will be adding it to my list of things to try. Crafting is my go to cure for any and everything! Thanks for your hop today! I love your coloring and I sure love to craft!!! Your card is beautiful and thank you for sharing your story. Crafting is good therapy, no doubt, and I'm glad it helped you when you needed it most. Now the rest of us benefit from your talent! Thanks for the inspiration. Beautiful card today! Your coloring is first-rate. So glad to see more people using crafting as a 'therapeutic' activity to help focus their lives. and maybe you don't believe it...but is is true!!. When I found your blog today through the blog hop...I was working with this stamp set too!! I making a Birthday card with Inktense pencils and also some PTI vellum(with dots) and the stamp set from PTI Sentiment splits. Beautiful card and coloring. Love how the white pencil acts like a blending tool and really smooths the look. Thank you for bravely sharing your story. Someone once told me, we compare our inside-selves to people's outside-selves. Social media doesn't help since 99% of the time it is sharing good experiences. Your work is beautiful. Thank you for sharing it! thank you for sharing your story. I've followed you on you-tube for a while and I'm so happy you have found card-making! I can agree that it is a great form of therapy. :) be well!!! Thank you for sharing. Great suggestions and that is a beautiful card. So, so pretty! Thanks for sharing your story as well. It can't have been easy. Bless you. Beautiful work. As a Prismacolor user I enjoyed seeing your use of them in card making. So many beautiful cards, its hard to say which is my favorite! Beautifully coloured floral image, and so happy to hear your wonderful "good news" story! Beautifully colored card! Thanks for tips on coloring and card making basics, and especially on crafting as therapy. I read your story, so touching and heartfelt, thanks for sharing and celebrating your amazing journey with this blog hop. Cuando comencé en este mundo del Scrap, caí en uno de tus vídeos, y de él me acerqué a ver tu blog para aprender de tus anteriores entradas. En tu presentación contabas que te habías iniciado en el Scrap como terapia y pero que no contabas tu historia porque no te sentías preparada... entonces sí que me enganché a ti y a tu blog y empecé a hacer tarjetas viendo tus vídeos... Siempre pensé que tu problema debía parecerse al mío pero después de haber leído tu historia no tiene nada que ver pero nuestro tratamiento ha sido el mismo, el Scrap. Y te estoy tan agradecida por haberme adentrado en este mundo que me ayuda a desconectar, a pensar en diseños, en nuevas técnicas... y que me acoge cada vez que quiero escapar de pensamientos que recuerdan malos tiempos. Mil gracias por compartir tu historia; sólo quería decirte que, gracias a la dosis de Little Crafty Pill que me regalas cada semana, me ayudaste a encontrar mi terapia. Mil besos. Y la tarjeta es preciosa... como siempre, Amanda. Great tips - pretty card! I love your card. I am so happy to hear that card making was a way to help you, what a wonderful story. WOWZERS! Gorgeous coloring and Gorgeous card! Thanks for the video! Preciosa tu tarjeta como siempre. Te lo escribo en espanol porque se que me entiendes: Lo mas importante ha sido tu historia y que la hayas compartido con nosotros. Estoy segura que con ella nos has ayudado, no solo a uno sino a muchos que como tu luchamos dia a dia. Gracias y recuerda siempre que no estas sola, eres fuerte y confia en ti. Lo has hecho maravillosamente y Dios y nosotros te lo agracecemos mucho. Felicitaciones Amanda!!! Estoy contigo, con tu talento y con tu amor a la vida!!! The journey you were on will be helping many people. Your story is a very touching one that caused a tear. Your beautiful card is wonderfully done and in pencil nonetheless. The leaves are pencil colored dramatically and so realistically. Thank you for you. This is such a pick-me-up for people whose minds are mired in negativity or sadness. Thinking of who this card will bless and how it will give someone else a smile, really helps me when I'm down. Thanks so much for talking about something we all go through. Your card is so beautiful, too! Such a gorgeous card, Amanda! Thank you so much for sharing your story with us...you are a true talent and a lovely person! Love your card! And I love how you color with colored pencils - it's beautiful! Thank you for sharing your story! I love this stamp srt and how you colored it. Lovely. Thank you for sharing your story and your self! I really appreciate it. I can't imagine dealing with all that at the age you did. I was much older, different diagnosis, but it still up-ended my life and left me adrift and depressed. Crafting made me feel useful and productive without depleting all my energy and got me off the couch and back into life. God bless you as you share these talents with others and discover others you may not know yet that you have! 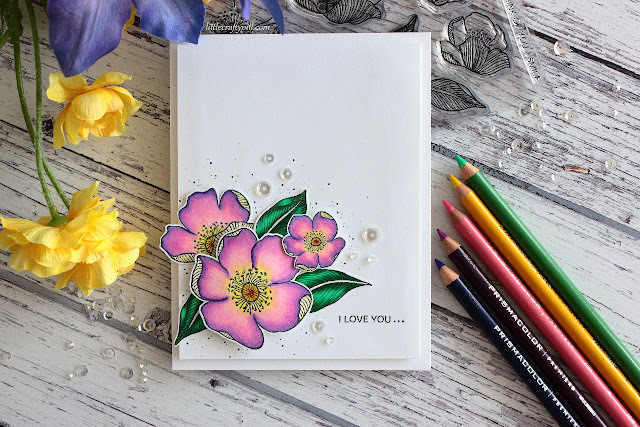 Your card is so pretty and I love how you colour with pencils, so much so that I am going to pull out my Prisma pencils and start practicing. Thank you for sharing your story. Wonderful card, love the stamp. TFS! The flowers look like they are GLOWING! You're amazing at coloring! Crafting is like meditation to me (sometimes). Great list! And the good news is that I already have the items on the list, so look at all the money I just saved. Probably enough to get some new stamps! Your story is amazing & the courage it took to tell it is inspiring. Your journey to recovery is so inspiring! I know so many people who struggle with some form of mental or physical illness and can't get over that hump to full recovery. I'm glad that you found crafting to get you there. Your card is beautiful! Wonderful colouring. I love that you show your thought process when placing things. Many others don't show that... it makes it real for me, since I am the same way. Such a beautiful card! I love your coloring! So so pretty. First I would like to say... congratulations and good for you!!! That you were able to overcome such a disease... or some call it a disorder but nonetheless, you overcame it and that is something to be celebrated! I can relate to you on crafting being therapy to help cope at a point in life when you needed something the most. I have a lot of health issues. I live in chronic pain all the time and so my life is not nearly what it used to be. I cannot do the things I once loved to do and the things that I can still do, I have to do them with restrictions now. I am limited. Needless to say, I can relate to you and your story .. different health battles but the struggle is real. So happy that you are not having to deal with it anymore. Now moving on.. your card is absolutely GORGEOUS! I have everything you mentioned in your video as I have been crafting for a little over 20 years now. And WOW... you have some amazing talent with those prisma colored pencils! I use mine sometimes when I am not using my copic markers but I don't color that great with them, not like you!!! You color amazing! That card is so stunning Amanda... thank you for sharing your story and for sharing that beautiful card from start to finish in the video. You truly are a huge inspiration. I am a new follower to your blog and cannot wait to see more from you!!! Have a beautiful day and a great weekend! Eres genial Amanda, te mando un gran abrazo y mucha fuerza para seguir adelante! Simple but beautiful. I love the card! Thank you for being an inspiration in cardmaking and in courage. You have really made a beautiful card. And What a good idea to make a video of all the things you need as a base when you start making cards. Very nice! Thank you for sharing your story. I too believe that making cards is great therapy. Also, giving them is great therapy and I believe helps the recipient also. Hola Amanda! Gracias por compartir tu talento y ahora, una parte de tu vida. La verdad que para muchos las manualidades son una terapia y una manera de "escapar" un poco del mundo "loco" que nos rodea. Me encanta tu estilo y se nota el cariño que les pones a tus tarjetas. Nuevamente, gracias por todo! Un abrazo muy fuerte y bendiciones desde Salta - Argentina! I was so glad to read your story, and I already commented about it there. I do love this simple card you made with basic "ingredients" although I don't think I could do without my paper trimmer! I have been building my supplies over the last year and have been really enjoying card-making. Your story will help others who are going through the same thing. It takes a strong person to tell their story. Beautiful card! I enjoy your card creations. TFS! Love your gorgeous card, the coloring is so vibrant and beautiful!!!! This is my first time at your blog Amanda, and I'm so glad to be here! Thank you for sharing your story! It's such a thoughtful blog hop to put together. So thank you. Your card is just lovely! See you again soon! I do believe that card making and creative endeavors in general, are great therapy for life struggles as well as emotional issues. I am happy to hear that it helped you to heal and that you are doing well! Amanda, thank you for sharing your story. And thank you for reminding us that we don't need thousands of dollars worth of supplies to create beautiful cards!!! I so glad that card making was therapeutic for you. It has always been that for me as well. And while you were in therapy you made lovely things to send to others. Perfect! Beautiful flowers and gorgeous, vibrant colors! I like the sparkly embellishments. I really appreciate you sharing your talent and story with us. Amanda! Thank you for sharing your story. Card making is a form of therapy for me as well. I have yet to start a blog and you-tube videos, but would like to get started doing that as well. I LOVE to watch your videos and have learned a lot and been very inspired by your cards. Thank you! I believe card making can be therapy too. When I lost my daughter to cancer in 2014 and my grandson a few days later, card making helped me get through those first months of grieving. Your video will be very helpful to beginners. Thanks. Amanda I am so thankful you are ready to share with us. That is another mile stone for you! I think sharing in the crafting world is just a positive community to share with. Its always so beautiful to see how someone has grown and helps those that might be shy about their issue grow and perhaps share their story as well. you've come a long way.. Nicely done! I also suffer from a chronic serious disease and I agree with you 100%. Crafting absolutely helps me deal with everything. I also have three special needs kids who can be a handful. Crafting is an oasis in a chaotic day. Kudos to you for exposing yourself in this way, you are very brave! Brava! Your blog hop is really awesome, congrats ! Awesome card Love it !! Beautiful card, Amanda, but your courage is more beautiful. Thanks so much for sharing! A truly gorgeous card, Amanda! I do believe that crafting truly helps when we are overwhelmed with problems. My husband has cancer & we are really having a rough time but making a card or two helps the mind so much. He's even helped design a couple for me which gets his mind off all the tough times. So glad it has helped you through everything! I agree that card making is great therapy. I definitely miss it when I don't have the opportunity to create. Thanks for sharing your story. What a pretty card! Thank you so much for sharing your story and your talent! God bless you! Thank you for sharing how card making helped you overcome bulimia. I make cards as a way to handle stress. It's much better than eating every time I get upset which is what I used to do. Now I make cards instead. Tienes que tener mucho coraje y valor para hablar de problemas como el que has pasado. Me alegra mucho que cardmaking te haya ayudado y que estés alentando a otras personas. Tus tarjetas son preciosas! Amanda those flowers are beautifully coloured! I definitely enjoy my cm therapy at the end of each busy working day - it's a godsend. Que belleza! I love your coloring! Thanks for sharing your story with us, too. I agree that crafting is therapy. What a wonderful theme for a blog hop! I have also found crafting to be an excellent way for dealing with all sorts of things. Thank you for the inspiration! I stepped away from crafting and am slowly making my way back - it's very therapeutic! Beautiful card! I must practice my pencil colouring more so I can get beautiful results like this! I love the colors you changed to, and your shading is fantastic. Thanks you for sharing your recommendations for beginners. They are spot on! Thank you for sharing your courageous story, for reminding us how therapeutic crafting can be, and for demonstrating the beautiful results that can be achieved with minimal supplies. I applaud your bravery to share your story: I know it will reach out and help many. Your card is lovely....your flowers are Glowing! Beautiful card. I have that stamp set and I haven’t used it used yet. I’m going to try it in pencil this week. Thanks for the video. Your card is beautiful. Thanks for the video and thanks for sharing your story. Your card is BEAUTIFUL, and Thank you for sharing your story, I am very proud of you as I am sure a lot of people are! Crafting has gotten me thru a lot of unbearable pain and I am very thankfull for that. This is an amazing blog hop, thanks for having it. So pretty. I like the colors and the addition of the sequins. Thanks for sharing how card making helped you! I like your card and the way you colored it. I'm not too familiar with pencils so I enjoy watching someone using them. Love your card and your spirit! Te he seguido en Utube por mucho tiempo, me encanta el trabajo que haces, sencillo y lindo. Leí tu historia y me da mucho gusto que hayas encontrado algo que te ha ayudado a salir del hoyo. Yo tengo a alguien muy cercano a mi que cayó en una depresión muy muy fea, gracias a Dios con ayuda de psiquiatra y psicologo y medicinas pudo salir y ahora verla es algo extraordinario! Dió un giro de 180 grados. Para mi, las manualidades (me encanta hacer de todo, depende del humor en que esté) es como leer un libro, te pierdes un ratito de todo lo que te rodea y cuando regresas a la vida cotidiana tienes más energía. Thank you for sharing your inspiring story. I hope, like you, it helps whomever it needs to. This is so special. Thank you. Beautiful card and so easy to make. What a great video and card. Thanks for sharing your story. It's so great that you found something to lead you away from your struggle with bulimia. Thank you for sharing your story and your talent. Your card is beautiful. Beautiful card! Love the colours. Thanks for sharing your story! Wow! Gracias por compartir tu historia. ¡Qué bueno que por fin pudimos ver tu hermoso rostro! That’s wonderful that you have overcome your illness! I agree that card making is therapeutic. For me, it just calms me down and helps me clear my head of worries and stress. Your card is really lovely-beautiful flowers! Oh my goodness! I so admire your strength, resilience, and artistic talent! I do believe that crafting helps the soul. Thank you for your story and your card is beautiful. Beautiful card. Very touched by your story. Cardmaking was and continues to be my therapy, too. Just finished hopping. Very inspirational. A fantastic idea for a hop. Thank you. Really pretty card. I was diagnosed with lupus several years ago. It turned my life upside down. Cardmaking, painting, sewing, drawing, and basically expressing myself through my art, has helped me work through this to be able to create a new life for myself. Your message is very important and I’m happy you are sharing. Your flowers just glow. Thanks for sharing your story. Thank you for sharing both a piece of you via your story (and struggles) as well as your beautiful card! Thank you for sharing your story, and for the wonderful inspiration. Your coloring is quite beautiful. Beautiful little card. Very delicate looking. Love it. I discovered card making about a year and a half ago, after my husband unexpectedly passed away. Along with watercolor painting, making cards has truly been theraputic. Some days Im too tired from work to create, so I find a wonderful demo video to relax with. Thanks for sharing your story! Your cards are amazing and simple. Thank you for sharing. I enjoy watching your YouTube videos and ideas you have. Again thanks! Crafting is for me also therapeutic. I am a sevire lungpatiënt sinds a year and not used to do nothing nor do something slow. Because I don't have much lungcapacity I need to do everything slow and take my time to rest. That is verry difficult for a busy person as I am (were) and that's a thing whe working on. I am crafting all my life and in this time I am so glad that I can sit and colour of stamp or read the post, watch the video's on differend blogs with gorgeous things like here. That's are the things that make me smile and enjoy live. Love the card you made and the amazing colors. I started making cards for Operation Write Home so our troops would have cards to send home, however that organization stopped and now I just make cards for family and friends. Crafting and card making have given me some of the most calming and fulfilling times of my life. It lets me tap into a whole different part of me. Thanks for sharing your story. This is a lovely, CAS card! Thanks for your tips - I've been making cards for only a few years, and it is always great to hear new tips! So glad crafting has helped you through such rough times. It's pretty much therapeutic for many of us. And your card is beautiful! Loved hearing your heart! I've loved your videos & blog for a long time now- clean and simple with beautiful color is my favorite style and you do it well :). Beautiful card and like you I find comfort in making cards and crafty things. It is amazing how good it feels to complete something and it is beautiful! Hugs to you. Hi Amanda...it is a very nice card! And you know, I wish you all the best! Lovely! Thank you for sharing your story. Such a beautiful card! Your story has helped me so much. You are a very special person and I am going to try and do what you did. I'm not talented like you are but I can try to get better. Thank you so much. Lovely card. Thank you for doing this therapy hop. I lost my mom in January and then my dad in August. Making cards helps me cope. Well first off...your card is beautiful and I'm glad you showed how little you need to start making cards! I did scrapbooking for many years, so I had a lot of similar products to use to make cards when I started. You also just made me think what a wonderful gift it could be for an experienced card maker to give someone else looking to get into it. You could put all the basics in a sort of "starter kit". you could also add some of your own excess stash (since we all know ...as soon as you get hooked you want & buy way too much product)!! Sorry for dragging on!! Anyway..second...I read your story and I want to congratulate you on your awesome progress and for sharing it with us. I have a few demons of my own I need to work out...you've given me the desire to try to craft them out of me!! Thank you so much for sharing! You are an inspiration both with card therapy and with the process of making cards! In regards to the care you have shared, the colors on your flowers just pop off the paper and are so beautiful! Gorgeous card ... the colors are stunning! Loved your card. Thanks for sharing. Loved your card, your story and the great blog hop. Thanks! Beautiful card and heart. Thanks for sharing. Loved your video and card you made. I'm on my way to the hop! Thanks for so much inspiration in more ways then one! Thank you for sharing your story with us. I do believe in card making therapy as well. it helps me to relieve stress and unwind. Your card is beautiful! Thanks for sharing your story. Crafting is my therapy when life gets hard. Great card! Dear Amanda and all who shared their stories thank you! Amanda thank you for your blog thank you for your cards ❤️���� thank you for courage sharing your story and thank you for your inspiration! Just sharing your story it’s very inspirational and supportive to each of us who struggles and found cardmaking and doing crafts in general helped and continues helping with our life challenges! Love your cards, they are so beautiful and your techniques easy to follow! Thank you for blog and chance to win some goodies! Wow, it was just mesmerizing to watch you color! I learned so much about coloring with Prismas from your video that I cannot wait to apply the tips and techniques I picked up the next time I color. Thank you for organizing the hop and sharing your story. Beautiful and amazing!!!! I totally feel you, although we are not anywhere near the strip on the day of the Las Vegas massacre, but I know people who were not so lucky, the first few days after it happened, the mood here in the city is really low, I had to go to my craft room to keep my hands working to take my mind off things, it really helps! Really enjoyed your video and such a lovely card! It was very generous to share your story, and more common than we realize. Thanks. Amanda, your videos are always so inspiring. Thank you for sharing your story.